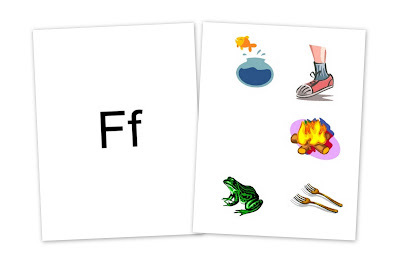 We have been moving on in our alphabet studies, but I want to be sure to catch up with the few posts that I missed, so this week I am posting what we did for the Letter F.
I have to say that this is one of my favorite alphabet book crafts yet. :) The little fish with his googly eyes is just too cute for words. And Zachary definitely liked the glitter. I cut out the fish and the "bowl" along with some water and he glued it all on and then used a paintbrush to spread glue around so we could add some playsand on the bottom for the sand at the bottom of the bowl. He also used blue glitter to make the water a little more sparkly. 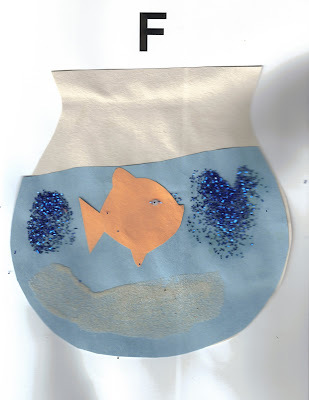 I wrote the letter F several times on a piece of paper and then Zachary had fun using some of my ink pads to put his finger print all over the letter F.
This week we made our own rainbow fish using two paper plates, a brad, tissue paper and tinfoil. One paper plate remains whole and the other one is used to cut a wedge for the tail of the fish and then attached using the brad. We made a watered down paste using glue and water and then Zachary laid 1-2" squares of tissue paper on the fish body and used a paintbrush to brush the glue mix over. Occasionally he used a square of tinfoil to make the fish glittery. Zachary let the girls be a part of this time with us this week (so generous that he is). We pretended to fly like fairies, fish, fight fires, float in the water, freeze, fall like a leaf, leap like a frog....and then had fun playing a game of leapfrog together. Click on the thumbnail to download the worksheet. This week we used playdough as part of our writing time. We rolled out skinny snakes and then had fun forming them into the letter "F". We also used the worksheets (similar to Handwriting Without Tears) that I made.